Ref: SL042 Supremely Surgeon. 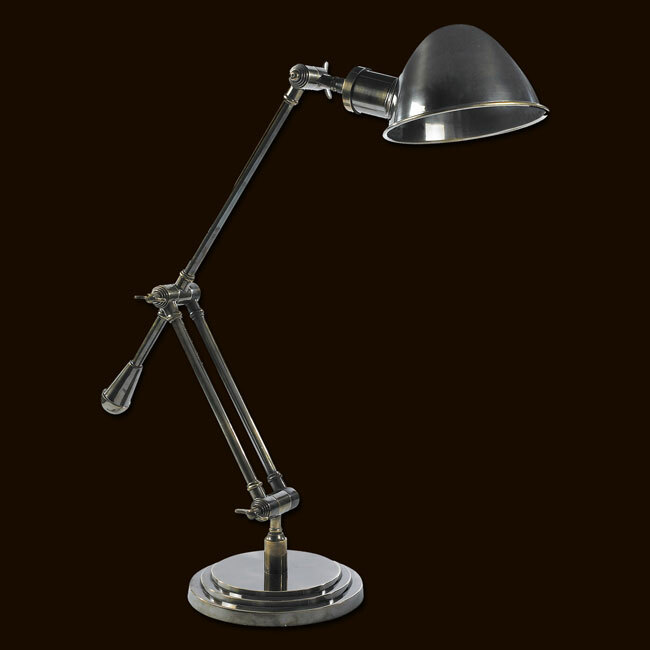 An original WWII operating theatre lamp found in isolated storage somewhere in the Pacific. Imagine MASH-like scenes of on-the-spot surgery, instant diagnostics and solutions. Our replica vintage operating lamp is made of steel and aluminum parts. 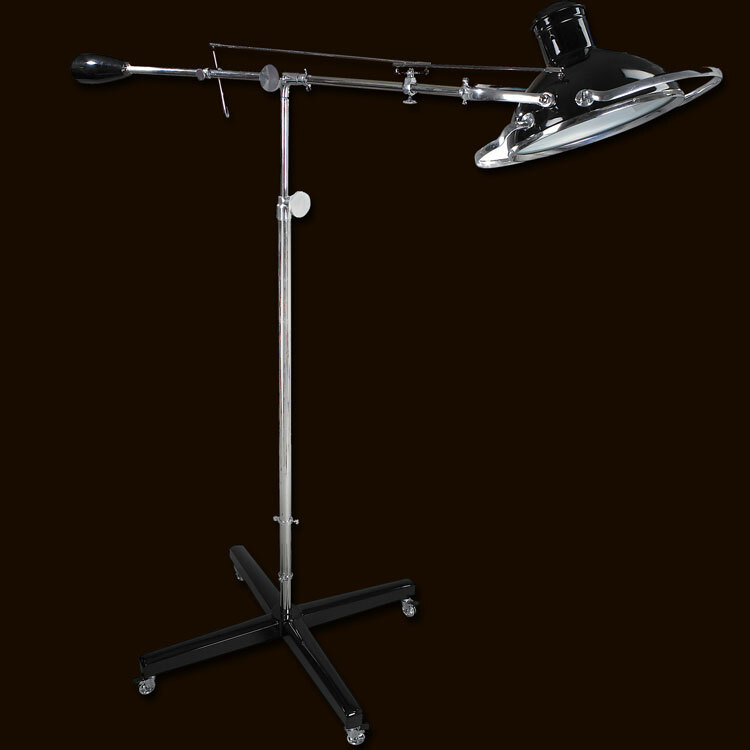 Adjustable shade and height. Heavy four leg base with quality castor wheels. Combines perfectly with both modern and classic furniture. 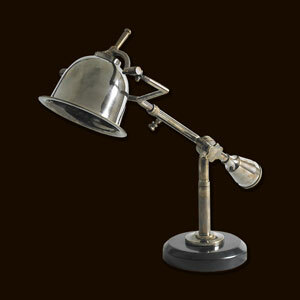 Great lamp! 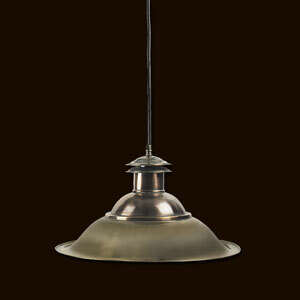 Ref: SL067 Elegantly curved offshoot of an antique port dock lantern. Ideal for dining or reading table. Solid brass and copper throughout. Complete with ceiling bracket. 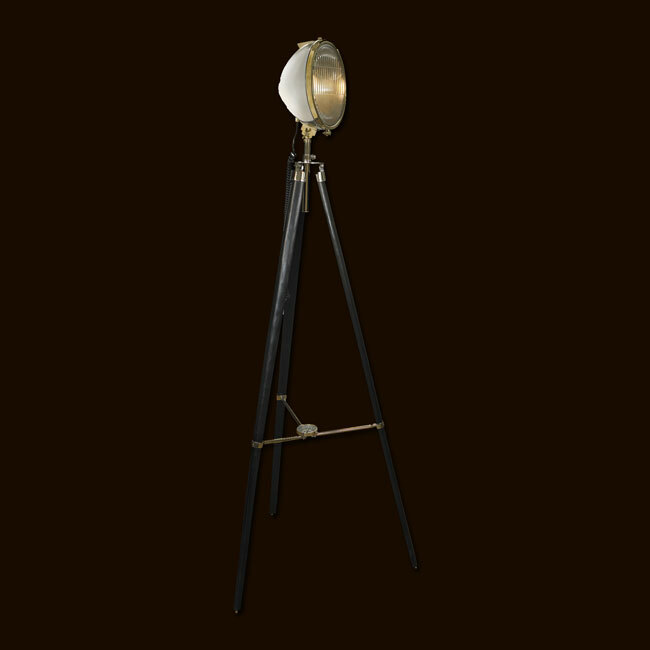 Ref: SL037 Its incredible that so few Admiralty lamps from the early 1900s have survived. But it may be many of them were refashioned into WWII gear, when people were asked to turn in brass and aluminum heirlooms. Plows to bullets. Using old and oft-forgotten techniques, we have been able to bring back the interesting shapes of early hold and go down lamps. Impressively large and practical, they were built to last. After finding the original at a Paris auction, we were spellbound when it arrived and we were able to unlock the wing nuts and study the construction. Replicas are made by hand, one by one, duplicating every design and technical detail of the original. Brass and aluminum. 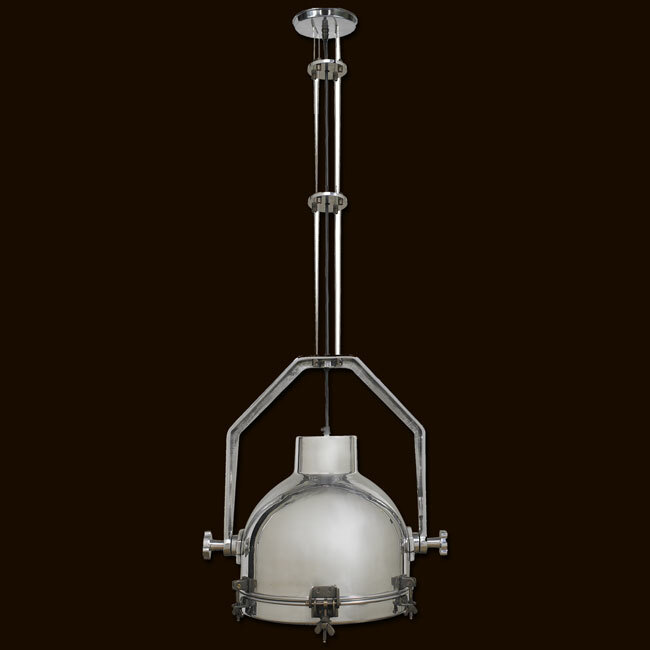 Complete with stainless steel hanging wires and ceiling bracket. Ref: SL019 The mud and sandstone walls hid the multistory palace of Imam Yahya, built in the 1930s. From one of the terraces where we were invited to dine in the evening we could look down some 1000 feet into the valley and the lights of the village. The floor was covered with bright carpets, pots with plants were everywhere, and the light came from candles set on tripods. Over chicken and lamb with lentils, followed by cake and cardamom tea, the Imam explained that the tripods were left by a British surveying expedition in the twenties, mapping the deserts and hills of Yemen. We were impressed by the fact that the metal and wood, combined with saddlers leather straps, still looked fresh and new, obviously a combination of quality and form follows function. 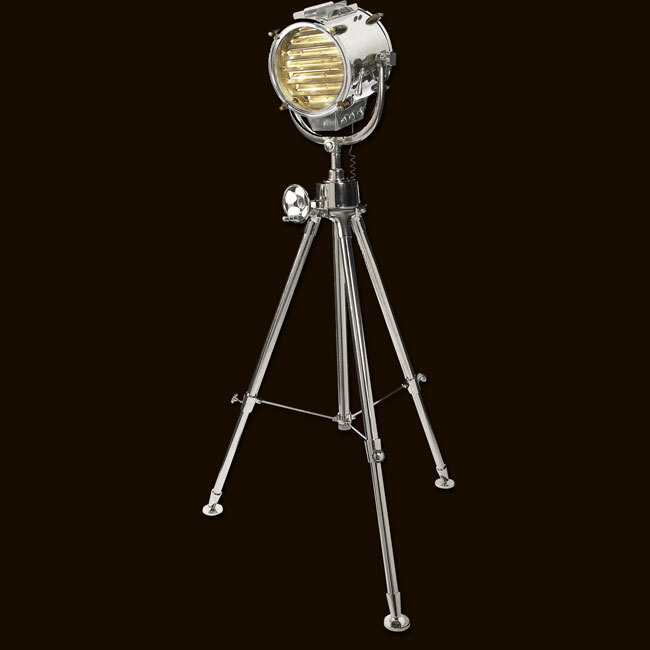 Ref: SL029 As always searching for the lucky find, the original of this 30s Navy spotlight was unearthed in an antique store in Greenwich, England. In a way the light is a wonderful combination of old technology, romantic seafaring and practical lighting. 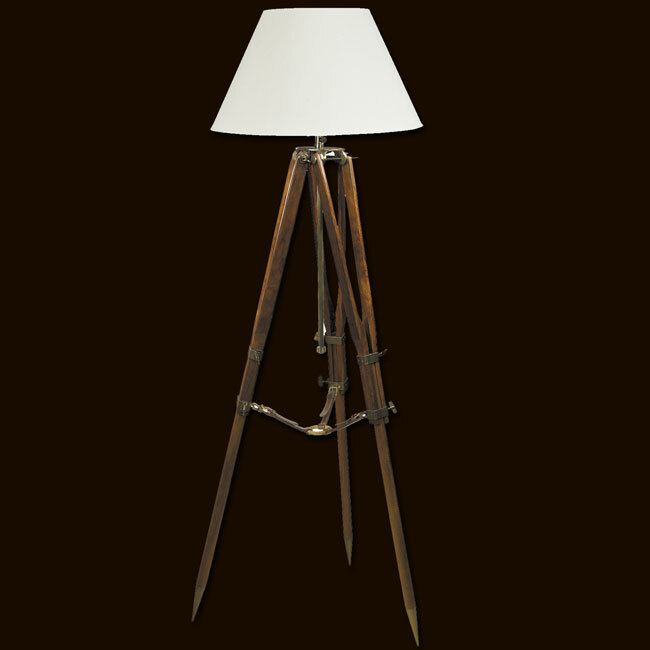 Perched on its imposing rosewood tripod the light dominates, adding character to a room, an important element in todays design philosophy. 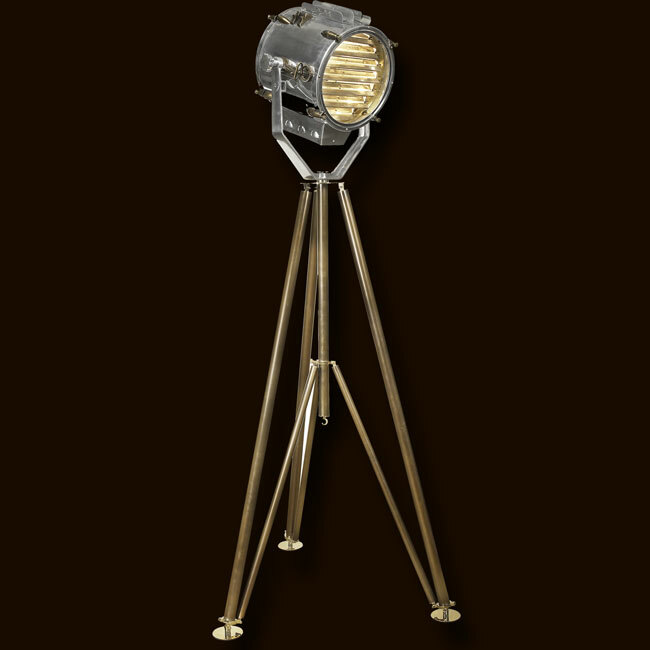 Our replica is exclusive to AM, hand-crafted of brass and aluminum. 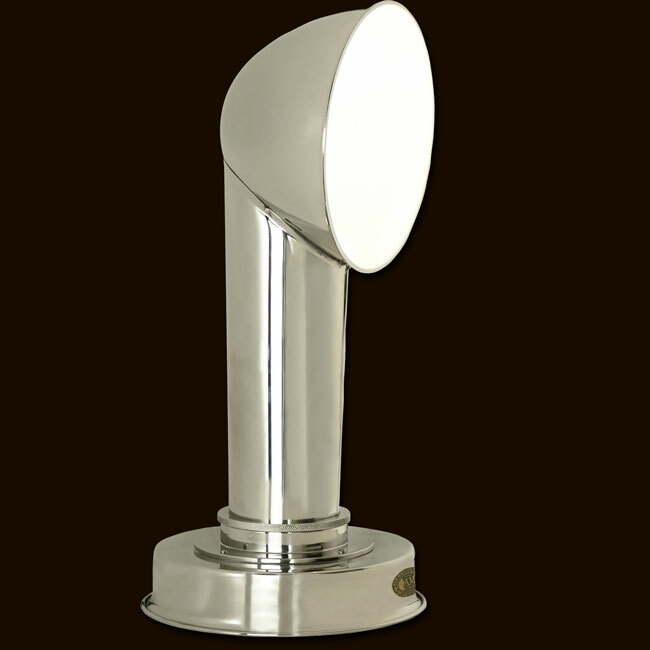 This is signature AM for those who value master craftsmanship and technical skills. Ref: SL035 Piercing the dark. Fronting a mile-long curved and polished hood. Nestled between sculpted wheel fenders while framing a huge chrome radiator. Bronze Art Deco accents. 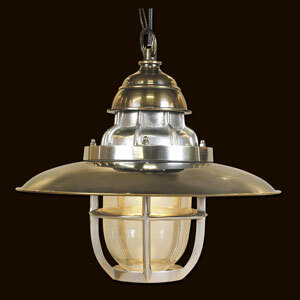 A combination of polished aluminum and brass brings home 1930s style, perfection and craftsmanship. 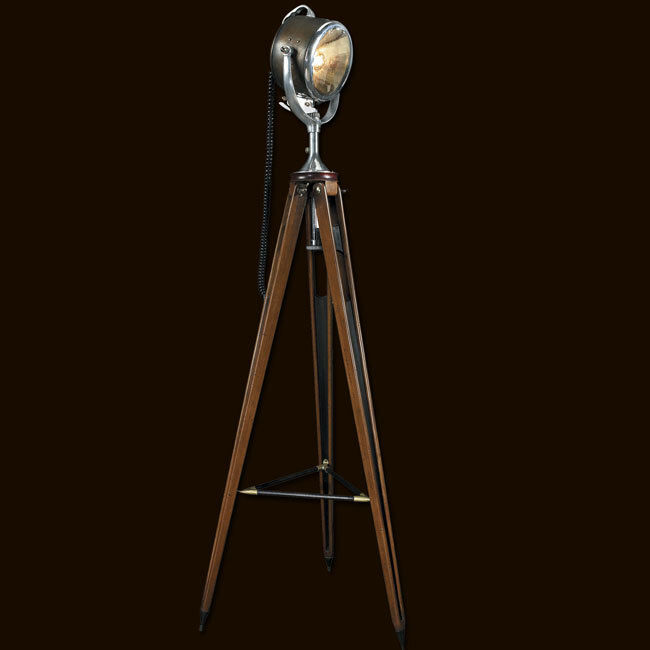 Check out its details, its imposing size, and the tall ebonized tripod complete with a travel compass dating back to the Mille-Miglia of the 1920s. Ref: SL039 International maritime communication used Morse as the standard code until 1999. Every Navy vessel carried a variety of Morse code devices on board. The large light next to the wheelhouse on the bridge was the most spectacular and effective one. 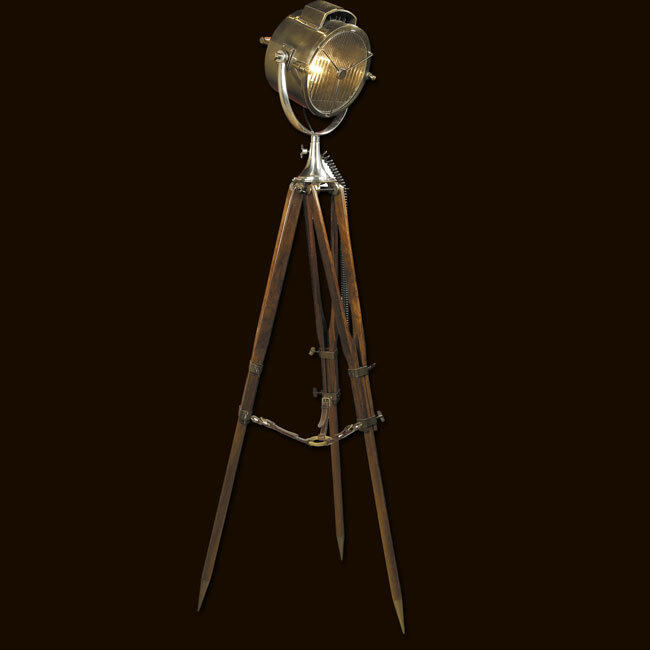 Handled by a specially trained sailor skilled in signals, it functioned as a ship-bound lighthouse, with the added ability to transmit highly detailed messages. Ref: SL040 When a friend of mine decided to move to Berwick-on-Tweed to start a B&B in a 13th C. bastion (with walls 10 feet thick and 22 feet high) he was confronted with the problem of how to flood the walls with the right kind of light. 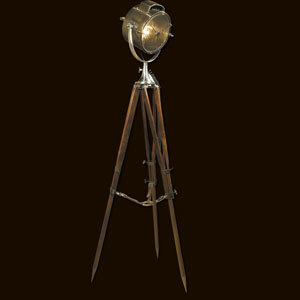 Being a smart and enterprising person, a navy stock lot of 1930s Half Mile Ray lamps was located. Originally constructed to last a lifetime, he rigged them in series, and to the best of my knowledge they are still working. 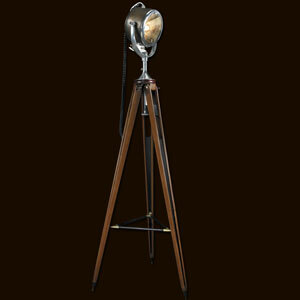 Our faithful reproduction is mounted on a mahogany tripod, its angle adjustable with a clever piece of 1930s technology. The overall look is cool, contemporary and at the same time historically correct. Ref: SL048 Our spotlight dates back to the 1930s and was most likely designed for use on a French battleship. By moving slatted louvers a signalman sent messages in visual Morse that could be read by trained men in the distance. Morse code uses long and short signals and combinations to convey a message. The elements making up the code were formed by sounds, marks and light pulses of varying length. Created in the 1840s, Morse code was in use for more than a century and a half. The famous S.O.S. sent by ships in distress (as on the Titanic) was sent by Morse code. 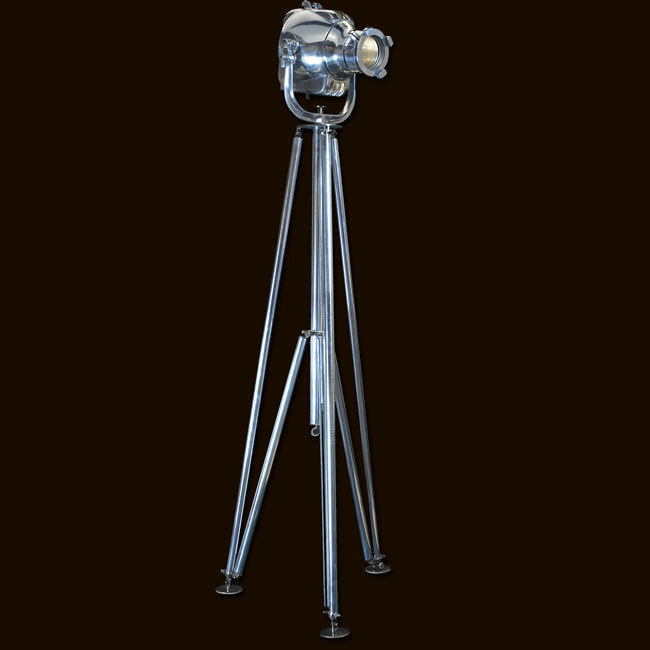 Our bold and striking new nickel and steel tripod stand is height adjustable. The lamp head moves up and down with the help of an intricate gear and cogwheel system.